Deciding how to decorate a child’s bedroom is not always easy. They change their minds from one month to the next, especially when they are young and fall in an out of love with TV and film characters. Unless you want to be redecorating every year you need to make sure that what you do is flexible for minor changes, and durable to withstand the children. They tend to use their bedrooms for a playroom, to watch TV, entertain friends and then to sleep. It needs to be able to accommodate all of these things, as well as not cost you an absolute fortune. Pale tones for the walls are a good idea as then you can add colour with accessories and toys. If their favourite TV character is someone like Pooh Bear, buy a teddy to show that you realise this, but do not plaster the walls with stickers and pictures of him and his friends. Children do love to have pictures hanging and often the first choice is of their favourite of the moment. You could get over this hurdle by hanging family photos instead, and if they are humorous ones so much the better. It is easy to find photo frames that will fit in with the room’s décor, or you see more here to help you. You’d be surprised just how many options there are out there right now. Any child’s bedroom, no matter what their age is, needs lots of storage. If you do not want to be constantly nagging them to tidy their room, you have to make sure they have enough space to put everything away. Some baskets in the bottom of a wardrobe or shelving fixed to the wall will all help them to keep their room in order. 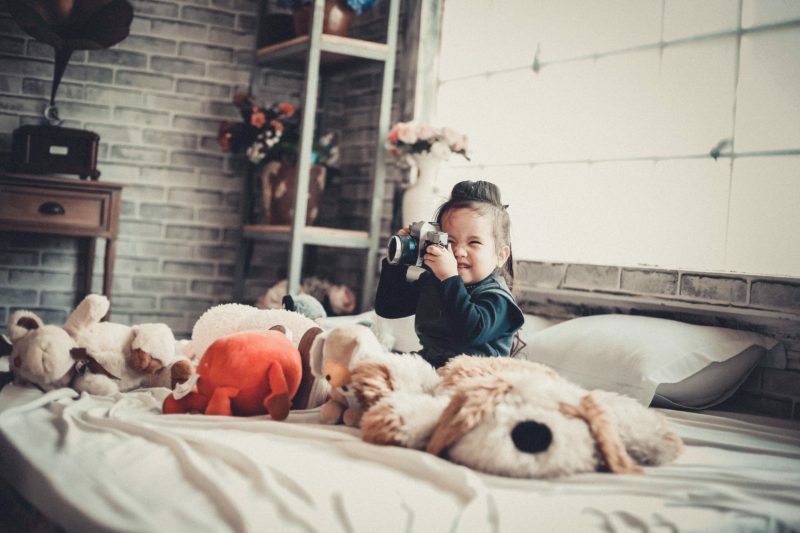 There are some things you can add to your child’s room that will help them learn without even realising it, as well as adding some style to the interior. A world map, and it does not have to be large, or a globe of the earth are both good. Plenty of books are great to help with their reading and language skills, and some paper and pencils can mean they can practice drawing and colouring skills. If these things are to hand in their bedroom, next time they get bored they might just use them instead of sitting on their digital device. Children are not as careful as adults when it comes to drinks and they are far more likely to spill on than you would be. The floor you put down needs to be able to cope with this or very soon you could be replacing it. It should not be too dark in colour so that it shows every scrap of dust or paper, and not to light so that it shows every little stain. Low pile carpets are the best for children’s bedrooms as they are the easiest to clean. It is good to let the children have an input into their room, but you also have to make sure you consider your feelings too so that it does not become an annual job. I asked my sister to paint the wall of my kid’s room with minions. She loves minions so much and it calms her to see one. I love the tips you have in here, thanks for this! Xoxo.